The thing about losing Republican Senate candidate Greg Brannon was that he'd never run for nor held any elective office. 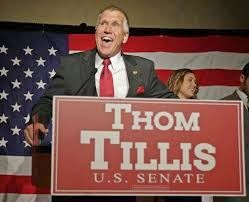 The thing about winning Republican Senate candidate Thom Tillis is that he has and therefore owns a nice, big, juicy public record to prove how far to the right he's been. The current public approval rating for the NC General Assembly is somewhere around 26%, and Thom Tillis as Speaker of the NC House can be justifiably cited as the author of that dismal dislike by the general public. Female Announcer: Tillis stopped Obamacare’s Medicaid expansion cold. It’s not happening in North Carolina and it’s because of Thom Tillis. He led the conservative revolution in Raleigh. Now Thom's gonna have to answer for that and for a lot more. His difficulties getting away from that record were deliciously highlighted by this video, which was actually shot at Tillis's victory party last Tuesday night. I wonder if there are any moderate Republicans or moderate Independents who could actually vote for him. . .